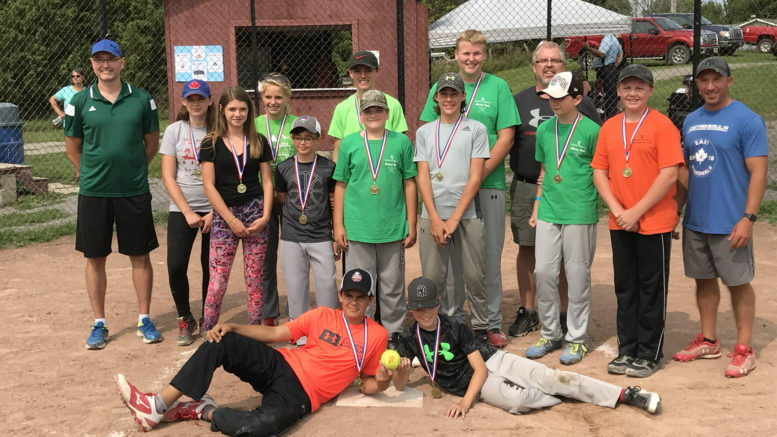 It was a battle of Napanee teams for the Minor Ball House League Championship on Aug. 18, with Napanee 1 facing off against Napanee 2 in Tamworth. Holden Breault pitched a gem with 11 strikeouts to lead his team to the league championships. The winning team was made up of (back row from left) Glen Oster (coach), Maddy Oster, Abby Kish, Pearl Monk, Lawson Reid, Matthew Hunter, Charles Gray, Rhyder Brant, Andrew Campbell, Scott Hunter (coach), Chevy Robertson, Damon Wease, Jason Barkley (head coach) while in front is Holden Breault and Jaydin Barkley. The coaching staff thanks the players and parents for a great season.